Convert your slim DVD drive to portable USB drive instantly. NO driver is needed in XP , VISTA and windows 7 or higher. 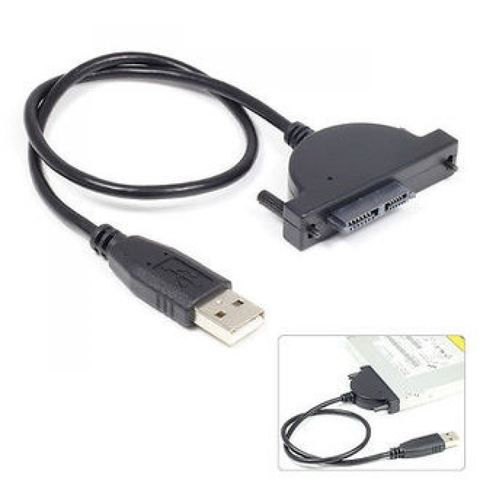 Type: Slim SATA to USB Adapter Converter Cable. Support :SATA DVD drive from laptops (such as from Lenovo T400,R400,Dell M4400,E6500 and other serial ATA optical drive) and 2nd hard drive caddy. Cable Length: 40cm / 15.75in(Includes the connectors). Adapter ONLY, CD/DVD Optical Drive Not Included!